Seattle pop explorer Perfume Genius (a.k.a. Mike Hadreas) recently released his excellent Too Bright LP. 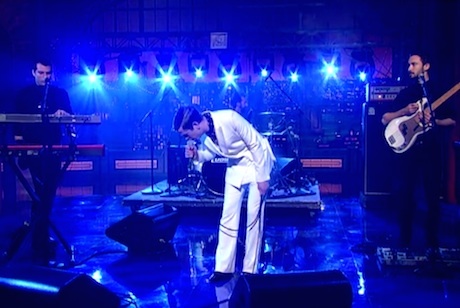 Last night (October 30), he performed on the Late Show with David Letterman. With a three-piece backing band, Hadreas didn't need to play an instrument. Instead, donning a white suit and bright lipstick, he commanded the stage with just a mic in hand as he delivered the song "Queen." Watch Perfume Genius perform on Letterman below.